There was something amiss in the Universe last week as forces beyond comprehension finally settled an argument between two major metropolitan regions. The rat, of course, had no way of knowing this. He was simply trying to get back to Brooklyn. Somehow he found himself in Chinatown. Chinatown is in Manhattan. The rat was obviously from Brooklyn. He wasn't big enough to be from Manhattan and so, did what every self respecting Brooklynite does after a rough day in Manhattan. He wanders down to the subway for the express out of Canal Street back into Brooklyn. Subways are relatively cheap and easy ways to get around town. For less than a gallon of gas you can make your way down to the platform, mull with the masses until the train rolls into the station. This is when the masses go into Dustin Pedroia mode. They line up at the edge of the platform and treat the subway doors as if they were an opposing pitcher going into his wind-up. As soon as the doors open commuters take off looking to slide safely into the first empty seat they can find. The rat didn't care for seating. He just wanted the quickest route back to Brooklyn but He wouldn't keep still. As soon the steal beast jerked out of the station he began racing up and down the car blowing New York cool right up in smoke. For the next 10 minutes there wasn't a seated passenger on the train. Those with seats jumped onto them and were quickly joined by straphangers who were without them. One transit worker called it the strangest thing he has ever seen. "When the train pulls into the station you see how crowded each car is. You see people sitting and standing. When this one went by all you saw were knees. I thought they were filming something. A flash mob, even." While this was going on in New York, Californians at a local shopping mall paid little heed to the four-foot long crocodile shopping along with them. 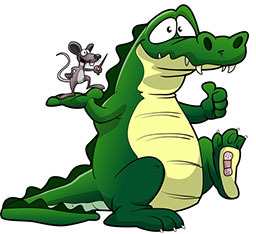 The owner of a handbag store spotted the croc at the entrance and quickly accessed the web from her smartphone for images depicting the difference between crocodiles and alligators. She was relieved it was a croc. "I was afraid he might come in and recognize an uncle or cousin in one of our fine ladies alligator bags and maybe create a problem, but we don't carry crocodile items." The croc probably realized this and moved on to one of the shoe stores where a manager seemed to be shooing him away. They probably didn't carry crocs and crocodile feet are actually kind of kiddie shoe small. I'm guessing they didn't carry anything for the youngsters. So there was no point in going in. Spending a day at the mall often leads to hunger and this is what separates humanity from the rest of Gods creatures. We wisely go to the food court. When the croc entered the pet store police were quickly called in to remove the beast. Law enforcement called animal control and the croc was roped and carted away. Probably locked up at some holding cell at the LA Zoo charged with assault and menacing of pet store animals. Meanwhile, back in the once just as cool Big Apple, the rat departed the train at the first stop in Brooklyn happy to be home and not giving a rats - uh - about changes in the universe or where the coolest heads really do prevail.